The Bank of Poland has issued a new coin honoring the life and work of artist Alfred Wierusz-Kowalski, whose paintings depicted ordinary life in the Polish countryside of the late 19th and early 20th centuries. Born in Suwałki, Poland on October 11, 1849, Wierusz-Kowalski received his education in the Warsaw Drawing Class and at the Academy of Fine Arts in Dresden and in Munich. Wierusz-Kowalski later set up a private studio in Munich and became a leading representative among Polish painters there at the end of the 19th century. The artist’s paintings were known for their realistic and emotive portrayals of everyday life in Polish villages and small towns, with scenes including horse-driven carts carrying passengers on muddy roads at dusk, excursions to the market, sleigh rides, wedding processions, and groups of carts on the way to church pulled by teams of horses. These images are set amidst the scenery of the Polish landscape, featuring meager trees, thickets, dusty roads, roads wet with melting snow, cottages perched in the distance, or woods outlined against the sky. The vibrant joyfulness of laughing peasants dashing through the snow in sleighs alternates with the melancholy contemplation of travelers getting ready for a journey at dawn. The realism of Alfred Wierusz-Kowalski’s work is not just a result of his attention to true-to-life detail, but also his ability to express the mood and the essence of the presented scene and its surrounding landscape. Evocative, atmospheric, and immersed in the realities of the 19th century, his paintings quickly won popularity when sent to exhibitions and galleries in European and American cities, gaining lasting fame for the artist. Distinctions, awards, and purchases made by state and private collections have bolstered Wierusz-Kowalski’s reputation as a truly talented painter. Today, the artist’s work is displayed in numerous museums. Alfred Kowalski died on February 15, 1915 and was buried in Munich. Later, in 1936, the political climate necessitated that his remains be brought to Poland, where they were interred along the “Avenue of Merit” at the Powązki Cemetery in Warsaw. 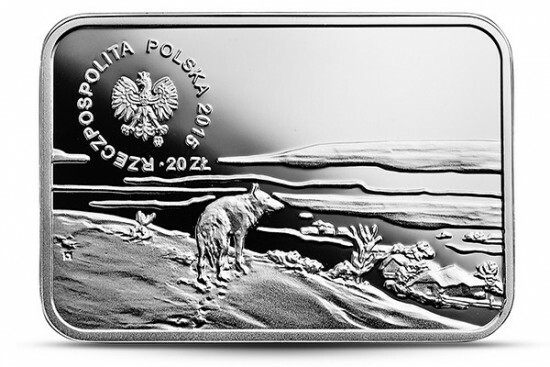 The coin, produced by the Polish Mint in Warsaw and designed by Dominika Karpińska-Kopiec, features on its obverse an image taken from of one of the artist’s most iconic paintings, “The Lone Wolf.” In the picture, a solitary wolf looks off toward a sleeping, snow-covered village. The national symbol is placed in the upper left corner. The reverse bears the artist’s portrait, based on a photograph taken at a Munich studio. A small palette of four colored paintbrushes is placed to the lower right of the portrait. 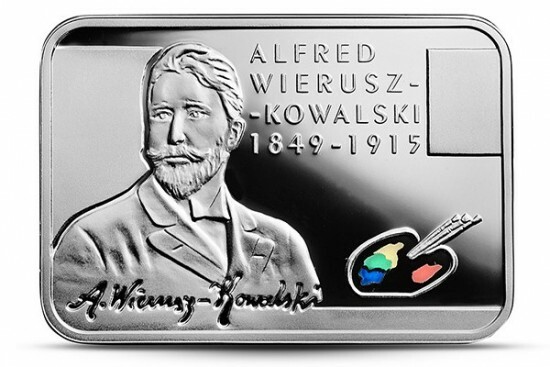 The series “Polish Painters of the 19th and 20th Centuries” continues with this coin dedicated to Alfred Wierusz-Kowalski. 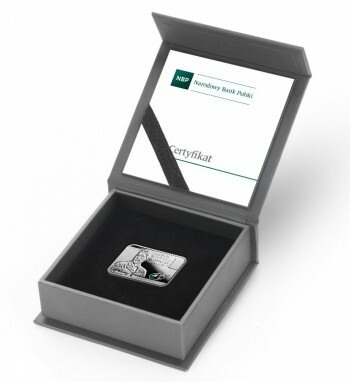 For more information on this and other coins issued by the Bank of Poland, please visit their retail Web site. Information is offered in English and Polish, with international orders dispatched where applicable.